Changes in water demand associated with population growth and changes in land-use practices in the Pinelands region of southern New Jersey will have a direct effect on stream hydrology. The most pronounced and measurable hydrologic effect is likely to be flow reductions associated with increasing water extraction. Because water-supply needs will continue to grow along with population in the Pinelands area, the goal of maintaining a sustainable balance between the availability of water to protect existing aquatic assemblages while conserving the surficial aquifer for long-term support of human water use needs to be addressed. Although many aquatic fauna have shown resilience and resistance to short-term changes in flows associated with water withdrawals, sustained effects associated with ongoing water-development processes are not well understood. In this study, the U.S. Geological Survey sampled forty-three 100-meter-long stream reaches during high- and low-flow periods across a designed hydrologic gradient ranging from small- (4.1 square kilometers (1.6 square miles)) to medium- (66.3 square kilometers (25.6 square miles)) sized Pinelands stream basins. This design, which uses basin size as a surrogate for water availability, provided an opportunity to evaluate the possible effects of potential variation in stream hydrology on fish and aquatic-invertebrate assemblage response in New Jersey Pinelands streams where future water extraction is expected based on known build-out scenarios. Multiple-regression models derived from extracted non-metric multidimensional scaling axis scores of fish and aquatic invertebrates indicate that some variability in aquatic-assemblage composition across the hydrologic gradient is associated with anthropogenic disturbance, such as urbanization, changes in stream chemistry, and concomitant changes in high-flow runoff patterns. To account for such underlying effects in the study models, any flow parameter or assemblage attribute that was found to be significantly correlated (|rho| ≥ 0.5000) to known anthropogenic drivers (for example, the amount of urbanization in the basin) was eliminated from analysis. A reduced set of low- and annual-flow hydrologic variables, found to be unrelated to anthropogenic influences, was used to develop assemblage-response models. Many linear (monotonic) and curvilinear bivariate flow-ecology response models were developed for fish and invertebrate assemblages. For example, the duration and magnitude of low-flow events were significant predictors of invertebrate-assemblage complexity (for example, invertebrate-species richness, Plecoptera richness, and Ephemeroptera abundance); however, response models between flow attributes and fish-assemblage structure were, in all cases, more poorly fit. Annual flow variability also was important, especially variability across mean minimum monthly flows and annual mean streamflow. In general, all response models followed upward or downward trends that would be expected given hydrologic changes in Pinelands streams. This study demonstrates that the structural and functional response of aquatic assemblages of the Pinelands ecosystem resulting from changes in water-use practices associated with population growth and increased water extraction may be predictable. 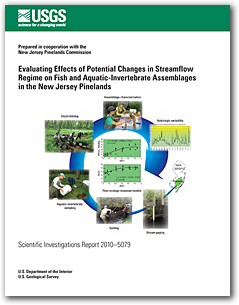 Kennen, J.G., and Riskin, M.L., 2010, Evaluating effects of potential changes in streamflow regime on fish and aquatic-invertebrate assemblages in the New Jersey Pinelands: U.S. Geological Survey Scientific Investigations Report 2010-5079, 34 p.